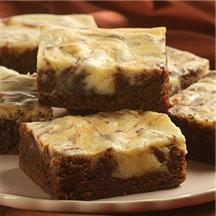 It’s hard to go wrong with these chocolatebrownies marbled with a sweet cheesecake mixture. 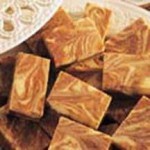 Melt butter and baking bars in a medium,heavy-duty saucepan over low heat, stirring until smooth. Coolto room temperature. Stir in 1 3/4 cups sugar. Beat in 3 eggs;stir in flour. Spread into greased 13 x 9-inch baking pan. Beat cream cheese and remaining 1/2 cupsugar in small mixer bowl. Beat in remaining egg and vanillaextract. 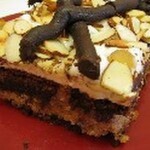 Pour over chocolate mixture; deeply swirl batters withknife. Bake in preheated 350ºF (175ºC)oven for 30 to 35 minutes or until wooden pick inserted nearcenter comes out slightly sticky. Cool completely in pan on wirerack. 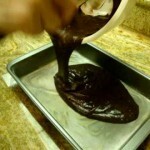 Makes 24 (2 dozen) brownies. 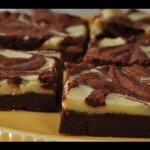 If the Fudgy CheesecakeSwirl Brownies recipe was useful and interesting, you can share it with your friends or leave a comment.